You are here: Home / Podcasts / Episode 67: Spreadsheets FTW! It’s an oft quoted mantra of bootstrappers… “If you want to find ideas for customs apps to build, find out where businesses use spreadsheets”. 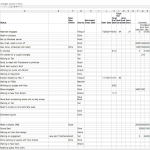 On the one hand, spreadhsheets are a gift of the gods when it comes to rapid prototyping. On the other, they often turn into huge festering masses of cross workbook links and unintentionally obfuscated formulas. You should use them for the former, and you should look for ideas in the latter. In this super exciting episode, Scott discusses the tracking spreadsheet he’s built to analyze and manage Blackfin, and Brecht gives updates from the road. And stick around ’till the end to hear some serious magic from Brecht!